The 'Paradis fantastique' on top of the Pavilion of France. 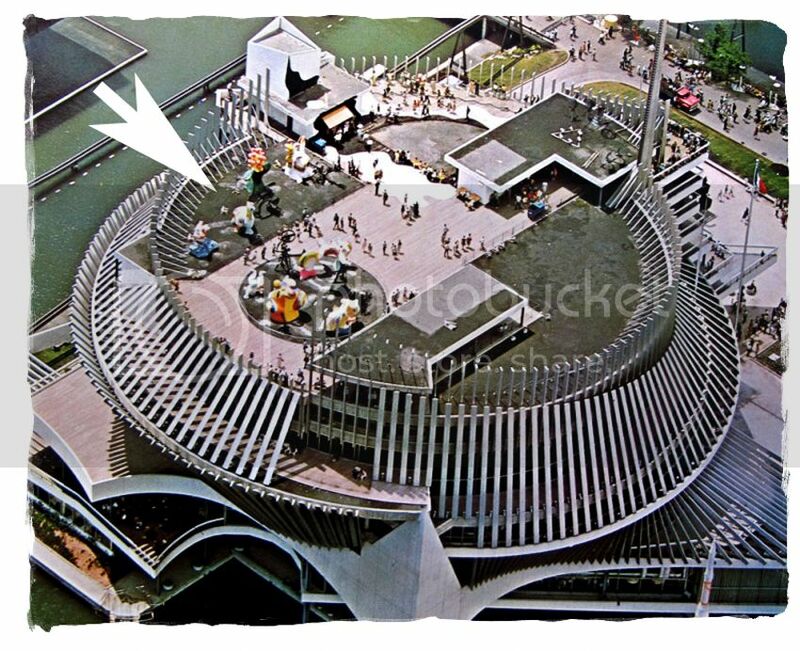 The France Pavilion was very popular in 1967 but most of the visitors never went on the terrace situated on top of the pavilion. There, you could find a large grouping of provocative sculptures made by Niki de Saint-Phalle and John Tingeley called 'Le Paradis Fantastique' (The Fantastic Paradise). These were rather large pieces and occupied a large part of the terrace. The resin sculptures were made by Niki and the Kinetic sculpture (made in metal and all had moving parts) were made by John Tingeley - both artists were married to each other (Niki died a couple of years ago from a cancer that was caused by inhaling the plastic resin she used in her work). The sculptures were made especially for Expo67 and were ordered by France. In 1968, the whole exhibit was moved to New York and exposed in Central Park. Afterward, the sculptures were exposed at the Albright-Knox Gallery in Buffalo (NY). Then, 'Le Paradis Fantastique' was acquired by the Moderna Museet in Stockholm. All of Niki's pieces were repainted in brighter colors (with the approval of the artist) and the Museum made a permanent garden site for the sculptures. Here are several photos of 'Le Paradis Fantastique' that I took while in Stockholm last year. I love her sculptures. Great stuff!! Actually, the only vivid memories of the pavilion of France is the rooftop and the amazing view. I had no idea that the sculptures went on tour after Expo. At that time, I did not live far from Buffalo and Albright Knox is an outstanding art gallery, It was built as the art pavilion for the 1901 Pan American Exposition but it was not quite finished in time for the fair and the art displays were housed in a temporary exhibit building. Albright Knox, which did open in 1902, is a spectacular neo-classical structure with a reproduction of Athens' famous Erectheum. It stands directly across a lagoon from the Buffalo and Erie County Historical Society building which is another breathtaking neo-classical structure built as the NYS pavilion for the Pan American Expostion. It is modeled after the Parthenon. Again, I cannot begin to thank you for the wonderful images and history you are offering us, Roger. I am so glad that you have found this site and I hope you stay with us! Roger, you said most visitors didn't visit the terrace on the top of the French Pavilion. Was the area open to the public or restricted to VIPs, etc.? I just read your post. I apologize for jumping in but if that rooftop was restricted, I had no problem walking up there, walking around with friends from my school and taking photographs. It must have been available to anyone who just followed his or her way to the roof. It wasn't restricted - sorry if you got that impression. What I wanted to say was that most visitors stayed in the first 2 or 3 floors of the pavilion, only a small amount actually went to the terrace. If you remember your visit, the last floor of the pavilion was for French authors. There were small booths with photos and a brief biography of authors like Moliere or Victor Hugo and excerpts of their works were read. Everything was in French, of course and most visitors spoke English and didn't seem to have an interest for that section. So they went by the exhibit rather fast and went down again instead of going up to the terrace. Do you know what material was used for those sculptures? It is interesting that the surface was made to look like papier mache'. The inner structure of her sculptures are made from fiberglass fibers reinforced with epoxy on which she added a liquid acrylic coating. The paint used is usually epoxy based. All in all a very toxic mix since she almost never used a mask when spraying those products. Most of her sculptures were made this way.